Last night, the boys and I headed to Ward’s Island to run the Sunset Shuffle. This has been a favorite race of ours for years. Skipper and Little Ironman have both “run” it in their baby joggers and have medals to show for it; Skipper came 2nd overall and, a few years later, Little Ironman came home with a 40-49 medal. Yesterday, though, was Mommy and Daddy’s night to race and Superfriend, Delilah, came to mind the boys (and take pictures). There are two things I like about this race. First, I know the course well because I have run it several times. Second, while it is a low-key race, it can draw some good local competition. Just before the start, we were told that there was a slight change in the course from previous years; we had to turn right at an intersection and run the course backwards to what we use to run. The reason was simple: the front runners didn’t have to cut in front of the others on the home stretch. However, this meant that the first 3.5k were running into the wind so, when the gun sounded, I tried to stay back. Honestly, I didn’t feel quite ready for 6K yet and I didn’t want to tire at the end because I went out too hard. Surprisingly, it was easy to hold my position for the first 6 minutes as there were some over-sized women in front of me who were impossible to get around. I just stuck behind them and moved ahead when the time was right. One of the things that I found frustrating at this race was I never really had a sense of how I was running compared to other women. I saw who was obviously going to be the lead gal take off at the start and there was a pack of 5 or 6 of us within 200 metres of each other for the first half of the race. I had no idea who and how many women were in between. I went out too fast (my first kilometre was 4:10) so I forced myself to slow down – a lot – and stayed with the pack as long as I could. By the time I got to 4K, I was fairly confident that I could hold my spot – even though I didn’t really know what that meant. I was running comfortable and my fear of running out of gas before I finished had disappeared. 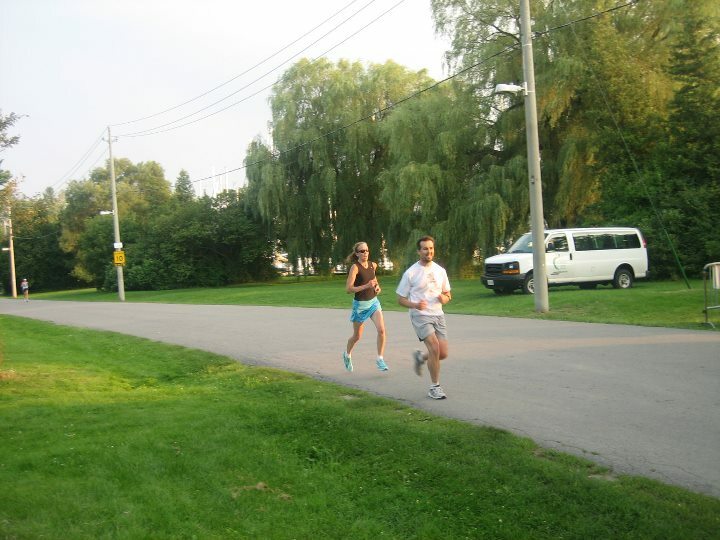 About 8 minutes later, I crossed the finish line, finishing the 6K in 26:53. Dave also finished strong, but a bit further back, crossing in 32:36, which meant he was hold a 5:30 kilometre. Official results still aren’t posted, but rumour has it that I was fifth female. Nobody really seems to know for sure (I told you it was low-key). 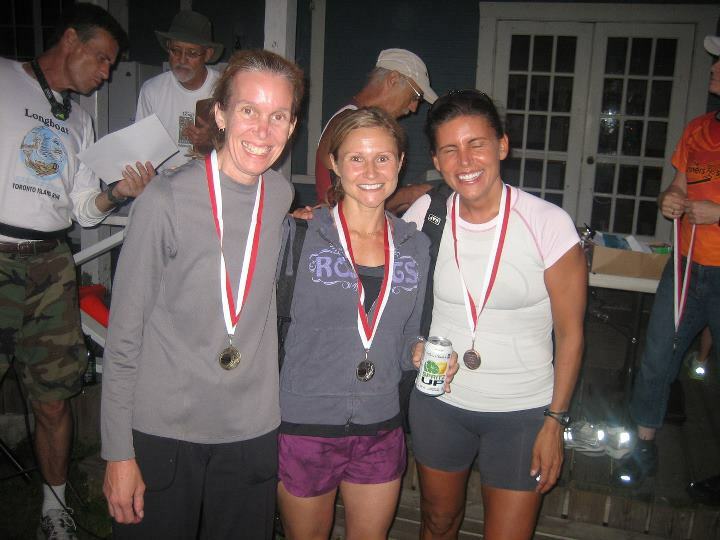 We are certain, though, that I was first in my age group, 40-49, and I have the medal picture to prove it. This was a big paparazzi moment for me as all sorts of men (and Delilah) insisted on taking pictures of us; I was literally blinded by the flashes going off. Should I have run this race, especially with it being so soon after Sunday’s? Probably not, but I felt fine so I went for it, and I’m glad that I did. Will I race tomorrow? No way! But that’s another story. Was a great race to watch. 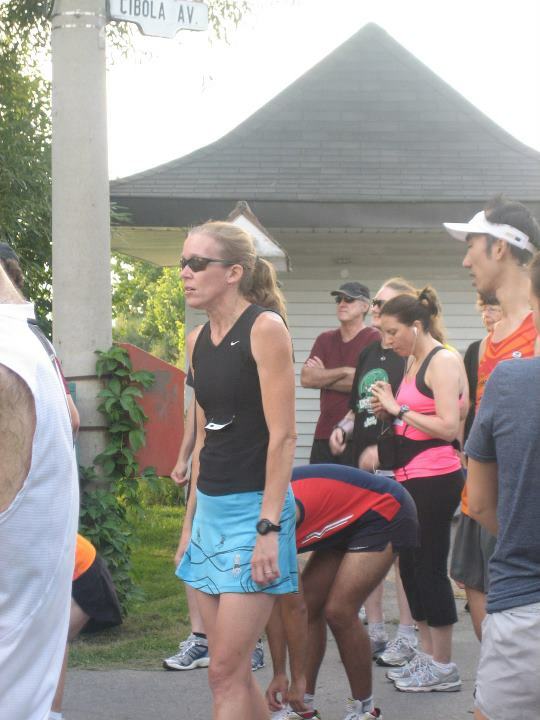 You looked super-strong coming to the finish…I do believe you were 5th female.. Way to go!! Congratulations on the AG award!! You ran a great race. ran this race last week too. fun run, been participating for a number of years now. Next Next post: Whose Punishment is This?